This Guide assumes that you have AVI video files (or video files that you can play on your PC with Windows Media Player) or that you already ripped your DVD's. If that's not the case, you should learn how to rip your DVD's (see below). 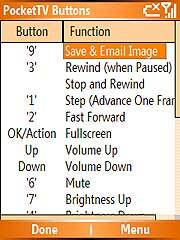 Guide and Frequently Asked Questions about converting DVD to MPEG. Discuss DVD conversion and MPEG encoding with other PocketTV users. The rest of this page will give you many pointers to more advanced guides and tools. If you want to produce your own MPEG-1 files suitable for viewing with PocketTV, we have put together a list of the best tools available including some freeware, and guidelines about the encoding parameters that you should use. Important! The default parameters of MPEG converters (video bitrate, audio bitrate etc) are not optimum for PocketTV. You should always use our TMPGEnc templates or use the parameters listed in in our guidelines in order to get optimum performances and small file size. Probably the most comprehensive site covering DVD and Video conversion tools and techniques. Check their guide and FAQ sections. A very good source for free video software tools. VCD, SVCD and DVD capturing, converting, editing, authoring and playing help. Templates, forums, guides and infos for converting video in MPEG format. The best software MPEG converter, and it's free! We hightly recommand TMPGEnc for creating MPEG's that work well with PocketTV. TMPGEnc has a large number of options but yet it is relatively easy to use (read our Simple Guide). TMPGEnc can take sources in many different formats including AVI and MPEG. We have used TMPGEnc to transcode DVD's and VCD's so that they can be viewed with PocketTV (between 500 Kbit/sec and 114 Kbit/sec) and have achieved excellent results. Check also this Guide to perform IVTC (InVerse Tele-Cine) with TMPGEnc. Note that the default parameters of TMPGEnc (video bitrate, audio bitrate etc) are not optimum for PocketTV. Just read our Guide and always use our TMPGEnc Templates to get optimum performances and small file size. Tools to do batch encoding with TMPGEnc, plug-in for converting MOV, etc. MPEG conversion program, can take a MPEG 1 or MPEG 2 stream and convert it to another format, changing video parameters such as resolution, frame rate, audio sampling frequency, and even do some cropping and letterboxing. Unfortunately we don't recommend using FlaskMPEG. The bbMPEG encoder used by FlasKMPEG is complicated to configure and much less efficient than TMPGEnc. VirtualDub is a video pre- and post-processor that works as a valuable companion to a video editor. SmartRipper is one of the best DVD VOB file extractor (so called "DVD ripper"). You can use it in conjunction with TMPGEnc to convert DVD to MPEG. Users have reported using the following software products to create MPEG's that work well with PocketTV. DVD converter and DVD rip software which can rip DVD and convert DVD to MPEG and many other formats. Sells for about $45. Convert AVI and DVD to MPEG. Sells for about $30. Convert AVI and Quicktime to MPEG (MPEG-1 and MPEG-2 supported). Sells for about $150. MAGIX Movie Edit Pro makes it easy to professionally capture & edit home videos. Import & export AVI (also with compressed sound), DV-AVI types 1 & 2, MPEG-1, 2, WMA, WMV (Windows� Media� 9), MOV, MXV, MJPEG, YUV, JPG, BMP, WAV, MPEG 4* and DivX�* (* requires installed codec). Sells for about $99. 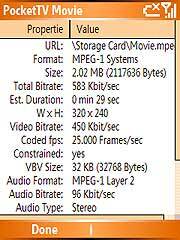 Can convert AVI, DV-AVI, DivX & MPEG-4 files to MPEG-1 and MPEG-2 formats - especially VCD, SVCD and DVD. Handles predefined profiles ranging from Internet Low Bandwidth (200Kbps) to HP@HL (100Mbps, 60frame/sec). Sells for about $49. One of the best tools. 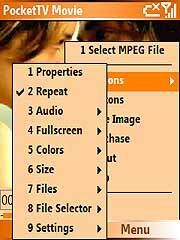 Can transcode between almost any video formats, including MPEG-1. Includes resampling and VBR encoding. Not cheap: sells for about $550. Supports MPEG-1 video (data rate 96 - 9999 Kbits/s), MPEG-1 layer II audio (data rate 32 - 384 Kbits/s). Prince unknown. Home page in Tchek. Can convert many formats into MPEG, including QuickTime (.mov files). Has editing capabilities, too. Sells for $29.99. You may need to purchase the Heuris MPEG Export Engine. Includes a transcoder to re-encode MPEG's with a smaller size and bitrate. An inexpensive, no-frill MPEG encoder plug-in for QuickTime. Heuris also has a more expensive professional encoder. The stand-alone LSX encoder takes only AVI source. Ligos also have an Adobe Premiere Plug-in (with Premiere you can use many other source formats e.g. AVI, MOV, DV, WAV, TGA, BMP, and FLC/FLI). A complete Digital Video Suite, offering Real-time MPEG capture, Real-time preview, as well as Real-time output. Sells for about $300. Probably the best MPEG conversion tool on the market. Also quite expensive, and handles only MPEG-1/2 streams. Can transcode MPEG-1 streams to a smaller size and bitrate. Inexpensive but limited quality. Japanese documentation only. Users have reported using the following hardware products to create MPEG's that work well with PocketTV. This is probably the cheapest MPEG hardware encoder, and a good value for the price. Users reported using this product to create 320x240 MPEG's that play well on the iPaq. MPEG1 320x240 (SIF) or 240x180 (Half-SIF), 24 fps or 30 fps, 350 to 450 Kbit/sec. Use 2, 3 or 4 B-frames between the P-frames 240x160 (Half-SIF), 12 or 15 fps(*), 180 to 200 Kbit/sec. MPEG1 160x120 (QSIF), 24 fps or 30 fps, 200 Kbit/sec. Use 2 or 3 B-frames between the P-frames 160x120 (QSIF), 12 or 15 fps(*), 64 to 80 Kbit/sec. We recommend that you try various setting allowed by your encoder to determine what works best for you. Those are just guidelines, you can try other parameters. If you want to distribute your MPEG streams, we recommend that you check that they play properly on the slowers Pocket PC models (e.g. Jornada 540 and Cassiopeia E-115). You may have to adjust the parameters (size, bitrate) to ensure good quality on those devices. Only the new ARM-based Pocket PCs (e.g. iPaq) will play properly MPEG files encoded in SIF size (320x240). A good compromise between size, quality and support for all Pocket PC platforms seems to be half-SIF (240x180 or so depending on the aspect ratio), at a total bitrate of about 400 to 500 Kbit/sec, with audio in joint-stereo at 64 or 96 Kbit/sec. These are the parameters used by PocketMovies.net, and the quality of their content is excellent and can be considered as a reference for quality. A good preprocessing (including de-telecine) is very important, and the source should have a regular frame pattern (e.g. 24 frames/sec if it is a movie source).